There’s never been a more exciting time to own your own franchise-model business. But as an entrepreneur, you’ll want to know which company offers the best franchise to own. At Visiting Angels, we’re proud of the fact that when franchisees and franchising insiders are asked What’s the best franchise to own?, our company is one of the very top responses. And no wonder! With our detailed business model, superior training and support, and high ROI, Visiting Angels has helped hundreds of aspiring business owners launch their own franchises. At Visiting Angels, we’ve not only been named a best franchise to own – we’re also recognized as one of the best franchise-model businesses to get started with. Visiting Angels accepts franchising candidates of all backgrounds and skillsets. Our training program is one of the most rigorous and detailed in the industry. We’ll provide you with the knowledge, skills, and materials you need to run a thriving business and to provide your clients with exceptional, compassionate home care. At Visiting Angels, we strive every day to provide franchise owners with the support, materials, and leads they need. It’s our goal to offer the very best franchise – and our results speak for themselves. The average yearly revenue for Visiting Angels franchisees is nearly $1 million, with a gross profit margin of 35-40%. But Visiting Angels offers more than just financial rewards. 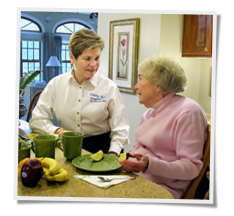 As a home care agency owner, you’ll become a vital, valuable member of your community, helping seniors age with dignity in the comfort of their own homes. Are you ready to own your own business? Take your first step with a company named a best franchise to own by industry experts and experienced franchisees. Request more information through our online contact submission or call Visiting Angels today.